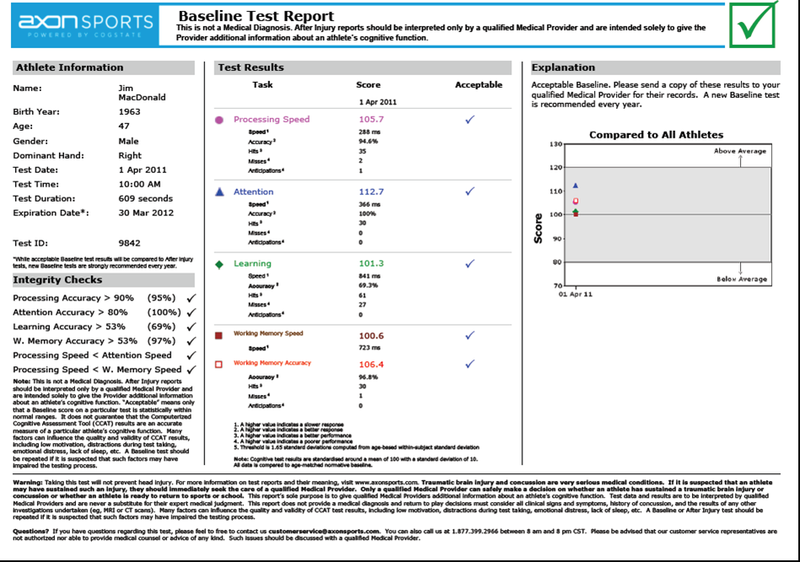 It has become a rite of summer over the last few years, at least here in the United States: ‘baseline’ neurocognitive testing (typically administrered by computer). Our practice has at this point in the summer probably tested one thousand+ local athletes from middle school to high school, primarily focusing on ‘football’ players (American football and soccer). It is a mass demonstration of an effort at secondary prevention. The intrinsic idea underlying this ritual is that we are establishing for each individual athlete their ‘baseline’ neurocognition, so that if they were to have a potentially concussive injury, we can re-test them and use the comparative results as one more piece of data in helping us diagnose and manage a concussion (and a return to play). Like a lot of sports medicine, however, this practice is controversial. I am not a statistician nor a neuropsychologist, and so if some readers quibble with my definitions, I am open to hearing about it in the blog’s comments. As I understand it, reliability is the property of a test that reduces in most respects to the concept of repeatability; some people describe it as the ‘stability’ of the test. It is, arguably, the most basic psychometric property of a test: one most first prove the ‘reliability’ of a test instrument before assessing other properties of the test (e.g. validity, and responsiveness). I plan to talk more about this idea, and the study on the computerized neurocognitive tests in the Archives, in an upcoming post. For now, I’d encourage you to don two things. First, click on the link and read at least the abstract of the paper referenced above……the reported results from the study may surprise you. Second, take the poll below and let us know your thoughts on this new, ‘rite of summer.’ I’ll report the results, and discuss the paper, in an upcoming blog post. See you then!